REUTERS/ Ki PriceU.S. musician Bob Dylan performs during on day 2 of The Hop Festival in Paddock Wood, Kent on June 30th 2012. Larry Charles, a key staff writer on ‘Seinfeld’ and the director of ‘Borat’ and ‘Religulous,’ sat down with comedian/podcaster Pete Holmes for this week’s episode of his “You Made It Weird” podcast. The best moment from the episode comes about 1 hour and 26 minutes in when Charles offers up a story about working with Bob Dylan. 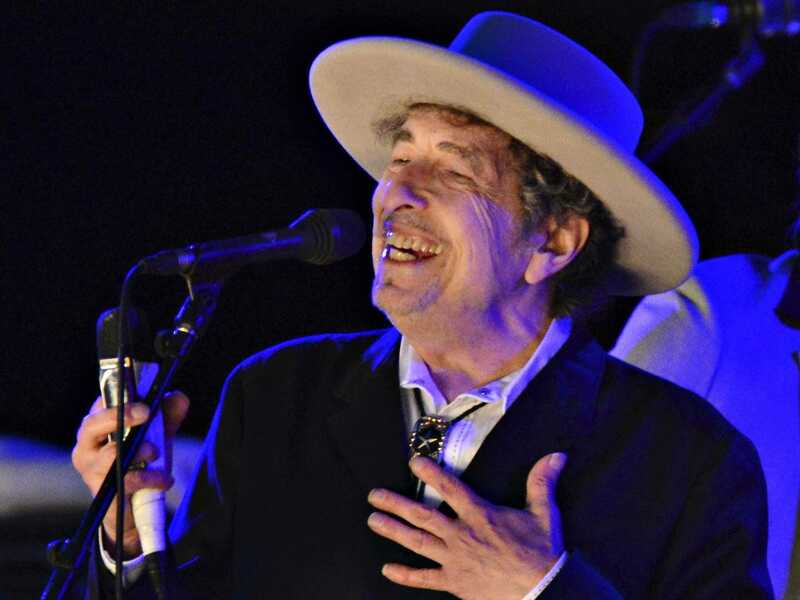 He mentions that back in the 90s, Bob Dylan was endlessly touring and stuck on a bus a lot of the time, so to combat his boredom, he would become “addicted” to different genres of movies and watch “every single one of them” during that period. At one point, he became “deeply into Jerry Lewis” and decided he wanted to star in a slapstick comedy. Not only that, but he decides he wants to do it as a TV series for HBO, and this is when Charles’ phone starts to ring. “He owns a boxing gym in Santa Monica, I meet him in the back of this boxing gym in a cubicle, he’s chain-smoking the whole time…completely smoke-filled…and his assistant comes over and says ‘do you want something to drink’ and it’s attached to this coffee house so I say ‘yeah, I’ll just have an iced coffee’ and Bob responds ‘I want something hot. I want a hot beverage,’ because that’s sort of how he talks, he talks in this very ornate way. So they bring a hot coffee for him, a cappuccino or something, and they bring an iced coffee for me and they put them together in the middle of the table and he immediately grabs my iced coffee and starts drinking the iced coffee. REUTERS/Mario AnzuoniDirector Larry Charles attends the premiere of ‘Borat: Cultural Learnings of America for Make Benefit Glorious Nation of Kazakhstan’ at the Ryerson theatre during the 31st Toronto International Film Festival in Toronto September 7, 2006. The festival runs from September 7-16. As the meeting progressed, Charles got some fascinating and unique insight into Bob Dylan’s writing process. “He brings out this very ornate beautiful box, like a sorcerer would, and he opens the box and dumps all these pieces of scrap paper on the table…and yes, that is exactly what he does…every piece of scrap paper was a hotel stationary, little scraps from Norway and from Belgium and Brazil and places like that, and each little piece of paper had a line, like some kind of little line scribbled or a name scribbled, ‘Uncle Sweetheart,’ or a weird poetic line or an idea or whatever, and he was like ‘I don’t know what to do with all this,’…and for some reason I was able to go ‘oh y’know you can take this…this is a line, this is the character, and the character could say this line.’ And he said ‘you can do that?’ and it’s like ‘yeah, yeah you can do that’ because I realised that’s how he writes songs, he takes these scraps and he puts them together and makes his poetry out of that. APU.S. 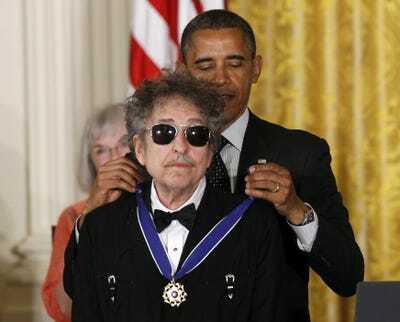 President Barack Obama awards a 2012 Presidential Medal of Freedom to musician Bob Dylan during a ceremony in the East Room of the White House in Washington, May 29, 2012. “So I show up for the meeting in my pajamas…and he shows for the meeting at HBO in a black cowboy hat, a black floor length duster, black boots, he looks like Cat Ballou or something, he looks like a Western guy who’s carrying six guns. “We stride down the hall at HBO, if you can imagine that scene, my hair is super long, beard down to my belly button in f*ckin’ pajamas and Bob Dylan is dressed like a cowboy from a movie. We go into the meeting and Chris Albrecht who was the president of HBO says ‘Bob, oh, so great to meet you, look I have the original tickets from Woodstock’ and Bob goes ‘I didn’t play Woodstock’ and then he walks over to the other side of the office which has floor to ceiling windows overlooking the city and proceeds to have his back turned to us for the entire meeting. “He never turns around, I have to start pitching this thing…this is who he is. Gavin Polone was there, who has my manager at the time, and he was like [whisper] ‘he’s like a retarded child.’ So I would go ‘Bob’s going to do this, right Bob?’ and at the end, ironically, despite all this discomfort, they bought the project, indeed. The final product, titled “Masked and Anonymous,” debuted at Sundance Film Festival in 2003 and received less than stellar reviews despite an impressive cast (pictured below). 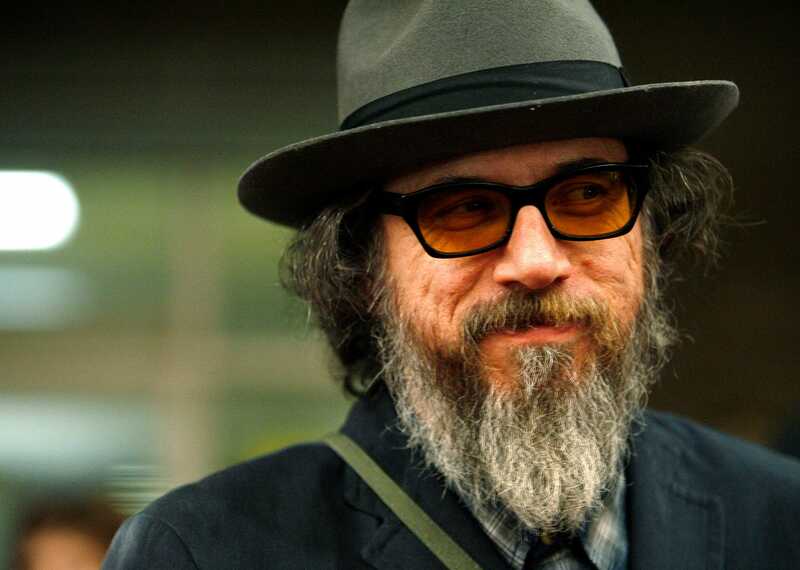 The episode of “You Made It Weird” was a quintessential example of what makes the longform, intimate interview podcast so special — Pete’s an incredible conversationalist, and Larry Charles was an open book, telling numerous great stories from his lengthy (and still thriving) career. Below is a YouTube clip with an abridged version of the story. The full episode is available for free here.